PDF's Printed. Bound. And Shipped. Add just 3.9¢ per page over 100 pages. Print, Bind, and Ship in one easy upload. Read Below! Experience the convenience. Affordable on-demand PDF printing made simple! You have a PDF. We love to print. $11.99 minimum order, plus sales tax if applicable. Again, this includes shipping. No one else does this! It’s your call at checkout. Combine multiple PDFs, or just remove pages from your PDF that you don't want before you print or download. Ensure the 1st page of multiple pdf's will appear on the right hand side like a new chapter in a book. Add new page numbers or a table of contents to your uploaded pdfs. Note: You must have all rights necessary to allow us, egrafa, inc, to reproduce the materials, prepare derivative works of the materials in any and all forms, distribute the materials and to display the materials that you submit to the printMe1.com service. Make printMe1 even easier to use for your students with our PDF Portal. Designed for instructors using OER, materials you have written yourself and hold the copyright on, or materials in the public domain, find out more. For engineering & construction professionals for printing large format, black & white, pdfs. 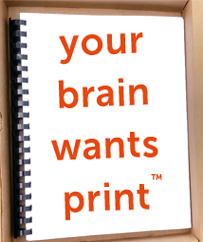 ©2018 Egrafa, Inc. "YOUR BRAIN WANTS PRINT" is Reg. U.S. Pat. & Tm. Off. printMe1.com & Get Yer Print On are trademarks of Egrafa, Inc.